During World War II, an iconic image that emerged to represent American women working in factories and shipyards while men were serving in the military, was Rosie the Riveter. The image was used to encourage women to enter the workforce to serve the war effort in factories. In 1948, three years after the end of the war, 31 percent of women were in the civilian labor force. Today, the U.S. Bureau of Labor Statistics reports that approximately 57 percent of women work. 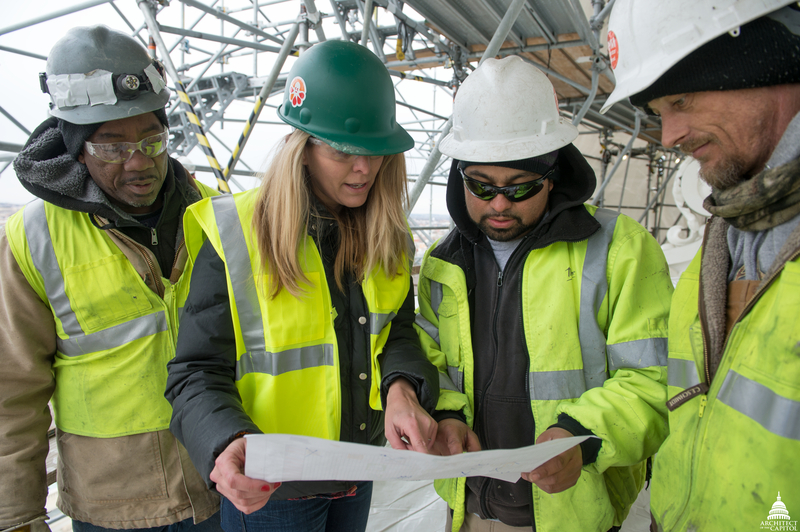 At the Architect of the Capitol (AOC), approximately 25 percent of the workforce are women who participate in a broad variety of jobs on the Capitol campus. Architects, lawyers, archivists, curators, engineers, human resources specialists, gardeners, custodians, technicians, arborists, technology developers and more are represented by female employees of the AOC. 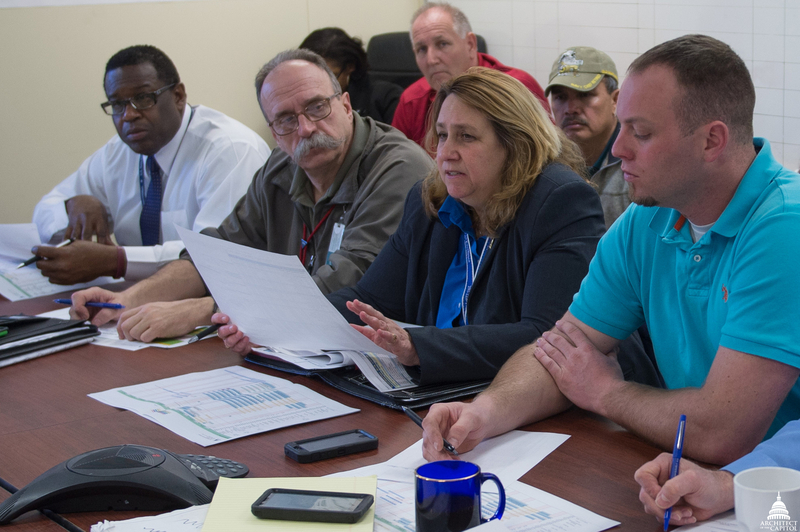 Employees of the AOC often have a front row seat to history and government. They are also public servants. 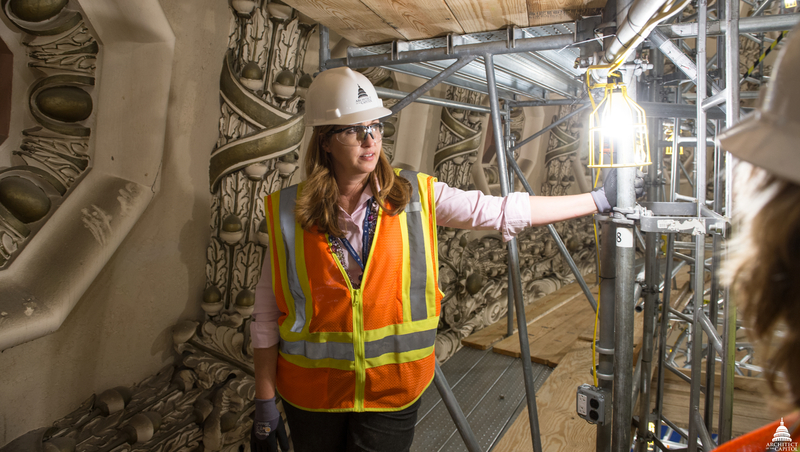 Architect of the Capitol's Christine Merdon sees the Rotunda Interior Restoration project work up close. The Chief Operating Officer (COO) for the Architect of the Capitol is Christine Merdon. She is the first female to hold that position. As a student, Merdon received an unexpected offer to study Civil Engineering. Recognizing the opportunity, Merdon jumped at the chance to start a career in that field. Today she revels in the challenges and successes of working on the Capitol campus. 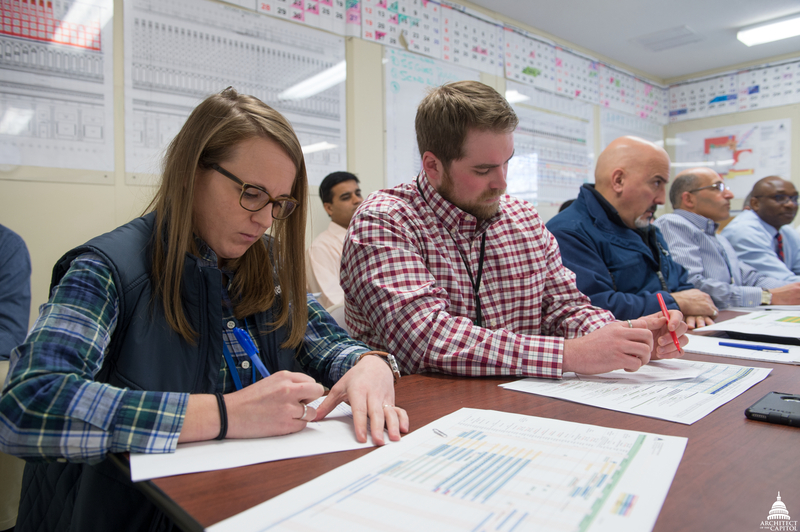 "I knew Civil Engineering was a great career, but I never expected that it would lead me to work at both the White House and the U.S. Capitol. I've met several Presidents and dignitaries during my career and worked on exciting projects that I am very proud of, including the MLK memorial and Nats Park," she said. As COO, "I look for opportunities to mentor, educate and encourage employees. To provide tools necessary to succeed, we developed the EXCEL program, Student Loan Repayment options and expanded the Telework program." In honor of Women's History Month, Merdon plans to reflect on the accomplishments of women in this country as well as at the AOC. "I want to encourage women to take opportunities, pursue your dreams, learn from others and not be afraid to try something new," she said. 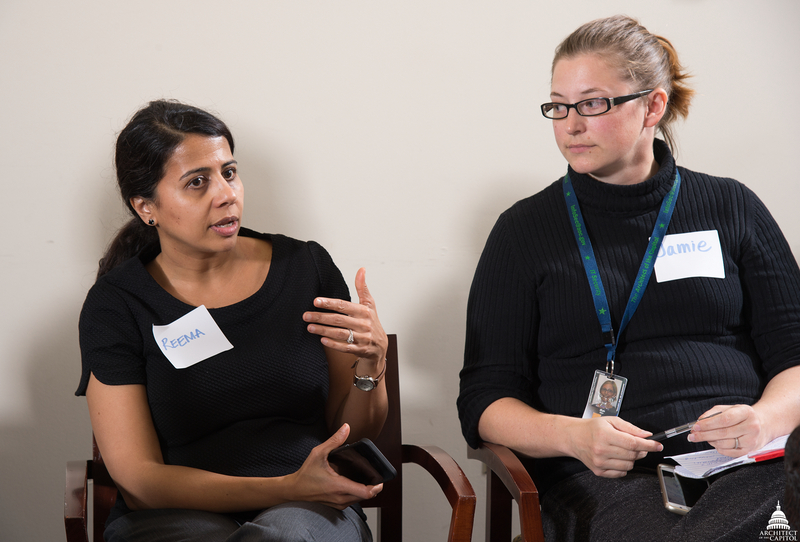 Merdon (right) talks about her job and what it is like working at the U.S. Capitol. Nationwide, roughly 15 percent of women work in the field of technology. At the Architect of the Capitol, Stephanie Faison, Internet Technology (IT) Project Manager, is responsible for implementing IT systems. She believes that encouraging more women to enter science, technology, engineering and math (STEM) fields is important moving forward so that more inclusive perspectives are represented in the development and deployment of technology changes. 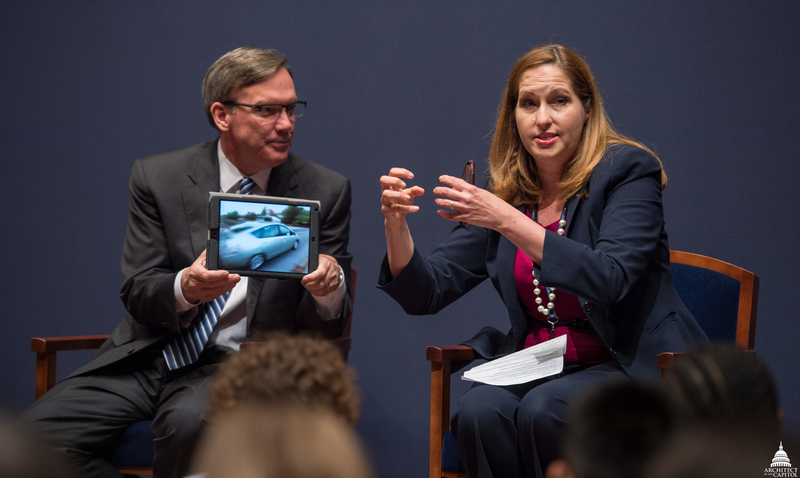 One of Faison's more memorable mentors, a former Chief Information Officer (CIO), taught her the art of negotiating and the value of putting the needs of people before processes. To Faison, celebrating Women's History Month is remembering the contributions of women from all backgrounds. "It serves as a beacon to young girls that seek to find their place in the world. And it reminds us that women can shine in all walks of life," she said. Amanda Biggs (top left) and other women are integral members of the Dome Restoration Project. 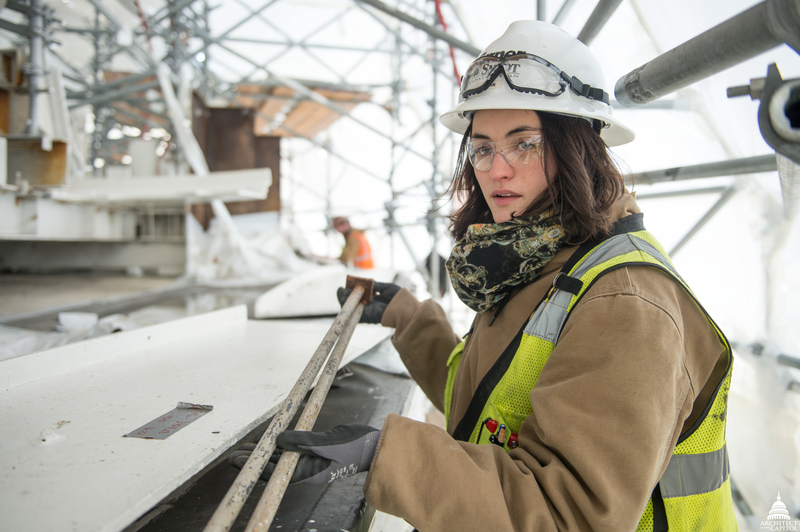 Amanda Biggs, a Quality Control Manager contracted on the Dome Restoration Project, works in another male-dominated field. "Construction is a tough industry, but it can also be very rewarding for anyone who has the passion and interest to put in the hard work and long hours." Biggs has always had an interest in design and building. As a child, she designed and built a house for her Barbie doll out of Legos. In high school, she searched for and found a college program that combined the technical and creative sides of building. Biggs' advice to young women interested in construction-related careers, "Don't be afraid of someone thinking you are too bossy or opinionated. These are typically viewed as strong leadership qualities for men but women tend to sell themselves short based on the perception they will be labeled that way." 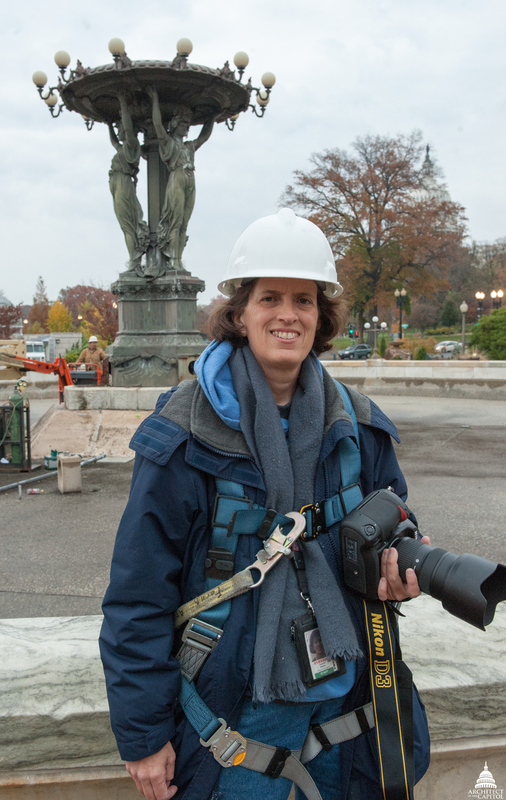 Susanne Bledsoe photographs Bartholdi Fountain. Susanne Bledsoe has spent more than 30 years as a professional photographer. At the Architect of the Capitol, she is one of five photographers and is the only female. "I've known since I was 12 years old that I wanted to be a photographer. There are artsy people in my family, so I guess photography was a natural outgrowth of my youth. Writers need to write, but I need to capture the moment," she said. Bledsoe, who also enjoys history, loves working at the AOC because she is witnessing and helping to document it. "This is a great place to work. The work is challenging and every day is different," said Bledsoe. When considering the meaning of Women's History Month, Bledsoe turns introspective, "Women who fought for the right to vote were demonized right here in the Capitol where I now work. Their efforts began a movement that ultimately made it easier for me to get into photography. I didn't have to be a teacher or a secretary, I was able to follow my dream. In the years to come, I hope to contribute in some way to women interested in following their dreams too." Women of AOC meet monthly to support and challenge each other professionally. 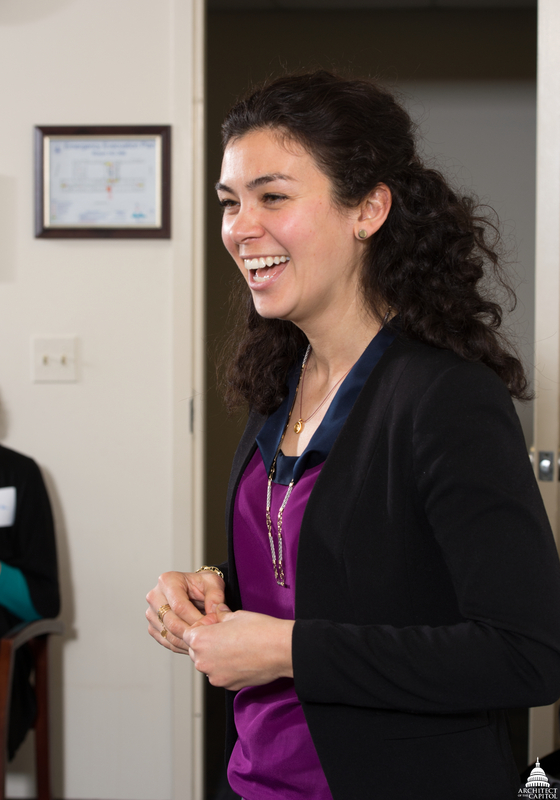 Earlier this year, Mimi Diez, Sustainability Program Manager for the House Office Buildings, organized Women of AOC, a voluntary group that meets on a monthly basis to encourage, network and challenge each other professionally. "This group developed organically and is open to all females in the AOC. Participants are diverse and come from every jurisdiction," said Diez. The group discussion has few rules or requirements other than being professional and positive. In a recent meeting, Women of AOC discussed mentoring needs, programs available at other agencies and what an AOC mentor program might entail. 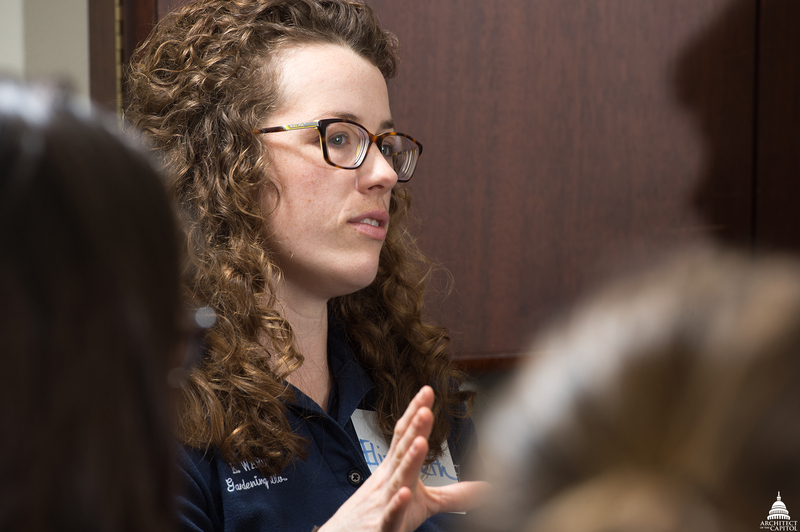 "We push each other professionally and help one another build relationships and navigate the work place," she said. Employees interested in joining the group are encouraged to contact Diez directly through the AOC email system. Just as the iconic Rosie the Riveter paved the way for women in the post-war era, the women of the AOC are proving there are no limits on how far one can go. While there is an iron dome on the Capitol, there are no glass ceilings.